MIEDECKE STONE Motorsport has a class victory – and potentially a strong outright result as well – in their sights following confirmation of their plans for next month’s Liqui-Moly Bathurst 12 Hour. The Queensland-based outfit, an Aston Martin Racing factory-affiliated program, will run a single Vantage V12 GT3 in the around-the-clock enduro, with George Miedecke, Ash Walsh and Tony Bates sharing the driving duties. The car is the same one that finished third in the 2015 Bathurst 12 Hour in the hands of Craft Bamboo Racing, and has since been completely rebuilt and upgraded to the latest available specifications. The three drivers make for an extremely experienced Bathurst combination, all with plenty of experience both in long-distance racing and at Mount Panorama. 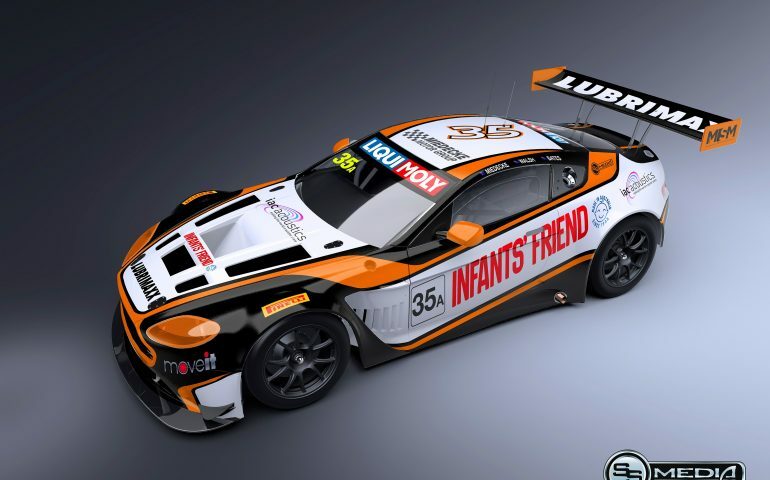 The team has confirmed that Infants Friend and Lubrimaxx will serve as the major sponsors, with Moveit.net and IAC Australia joining the program. The car will run in a distinctive Orange livery during the event. “We are heading to Bathurst with a lot of confidence and we’re really pleased with the team we have been able to assemble,” George Miedecke said. “We have had a year to come to grips with the Aston Martin, racing the cars in Australian GT. It’s a great car and one we already know that is a competitive package at Mount Panorama, too. “There has been a lot of focus going into this program and making sure that we’re ready to go the moment we get to Bathurst this February. It’s an exciting time for the Miedecke Stone Motorsport team to be representing Aston Martin in such a competitive field. Miedecke said the team would be targeting a class victory this February, with the potential for more in the back of their minds. “The obvious target is an ‘Am’ Class victory, though with the depth in the field it is clear that won’t be an easy thing to achieve, it’s going to be a hugely competitive race,” he explained. Miedecke Stone Motorsport will be the sole Aston Martin representative in Class A of the race, the team proud to fly the banner for the iconic British brand. “Aston Martin has an incredible history in long-distance racing and we’re proud to be representing Aston Martin Racing at the 12-Hour,” Miedecke said. Miedecke has tasted success in Australian Production Cars, V8 Utes, Supercars Development Series and last year combined with his father, Andrew, to win a round of the Australian Endurance Championship driving one of the team’s Aston Martin entries. Multiple Australian Karting Champion Walsh currently serves as Tim Slade’s co-driver in the Virgin Australia Supercars Championship Pirtek Endurance Cup – finishing 7th in the Bathurst 1000 in 2016. Victorian driver Bates is the reigning Champion of the Carrera Cup’s Challenge class, and doubled up last year by racing an Audi R8 in the Australian GT and Endurance Championship. Tickets and camping remain on sale and are available at the links above.